Those who think they don’t know much about Roman contributions to modern life need only take a good, hard look around themselves. 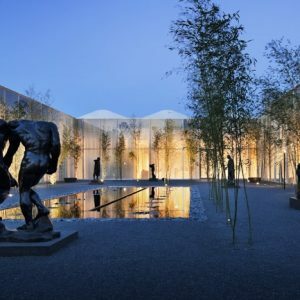 “When you peel back its influence on architecture, road building, finance and commerce – so much that happened in the Roman Empire was the precedent for what was to come in Europe and even globally,” says Mark Scala, chief curator at the newly re-named Frist Art Museum in Nashville, Tenn. In February, the Frist opened an exhibition of Roman sculpture, jewelry and objects from everyday life. Rome: City and Empire brings to Nashville more than two hundred of the British Museum’s most engaging and beautiful Roman objects to tell a dramatic story of how Rome grew from a cluster of small villages into a huge empire of 100 million people at its height. “It’s an exhibit organized by several different curators at the British Museum who wanted to give a sense of breadth of their collection, like the Bacchanalian sarcophagus and the bust of Augustus,” he says. Then there’s the brass and enameled armlet that’s Scottish – Caledonian actually – included because the exhibit displays objects made across the empire. “The Scots didn’t have brass so the assumption is that it came from a Roman helmet or shield,” he says. It’s an exhibition that tells not just the story of Rome, but of the empire the Romans built – in Western Europe, in North Africa and in the Middle East, including Palmyra in modern-day Syria. Part of that story is the idea that “All Roads Lead to Rome.” “Not only is that a statement in the abstract it actually was true – the Romans built roads out to the provinces so Roman goods flowed out to the provinces and provincial goods flowed back to Rome,” he says. And this is an exhibition about how economic relationships can be revealed though artistic style – even in the 21st century. The exhibition closes this Saturday, April 21 – but on Friday, April 20 the museum is offering free admission from 10 AM to 9 PM.